How do I start building my new Lobby Display App? Visit www.getsrpuceapps.com and sign in at the upper right hand corner. Which product do I choose from the sign in screen? Click on “Lobby Display” at the bottom of the list of products. What are my email and password to sign in? If this is your first visit to Lobby Display, sign up for a new account. (Note: the email address you use to create your account does not have to match the email address you use to access the App Store.) 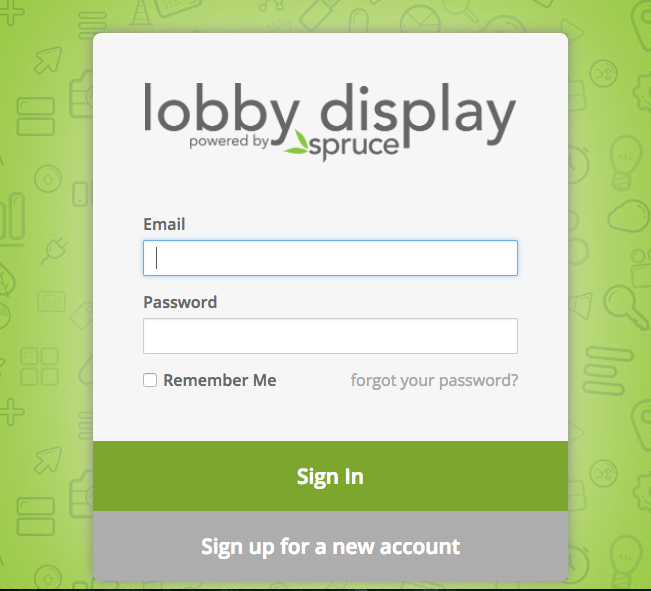 If this is your second visit, sign in with the email and password you chose when registering your account at Lobby Display. How do I create my new Lobby Display? Click on “New Lobby Display” in the top menu. How do I name my app to access it on the iPad? Click to edit “Passcode.” Your Passcode will be the name by which you access your new Lobby Display App on the iPad. Where do I change my passcode again? After clicking on “edit passcode,” you will be directed to a screen where you can customize your passcode. What happens after I customize your passcode? Once you’ve hit “Update Key,” you will return to this screen to begin building your app. What is the first step to building my app? Before doing anything, you’ll want to add files to the Media Library. What should I add to the Media Library? Upload any files you might want to include in your app to the Media Library, including your logo, photos, building maps, pdf files, etc. How do I add my logo to my app? Click “Add Logo” and choose your logo from the Media Library before saving. How do I add more sections to my Lobby Display App? Choose “Add Section” from the left-hand menu to further populate your app. What kinds of sections can I add to my app? 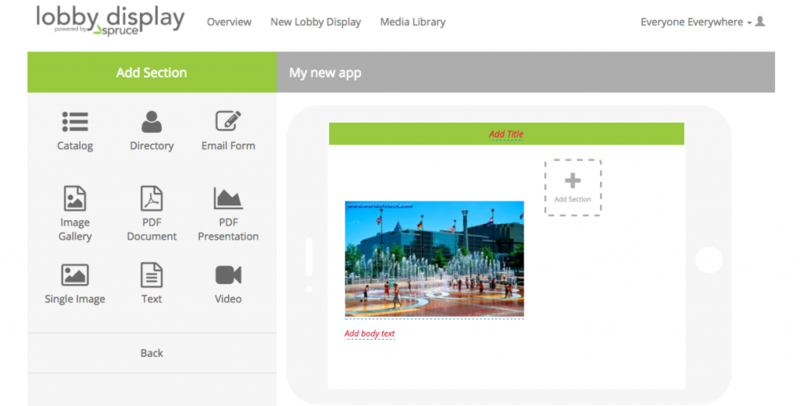 You can add almost anything you’d like to your app, from a catalog or PDF document to a Video or Email Form. What are my options for building a directory? Lobby Display App offers several templates for your Directory, including an Employee Directory and Schedule. You can also customize Directory sections if you would like a tenant directory. How do I populate my Directory? 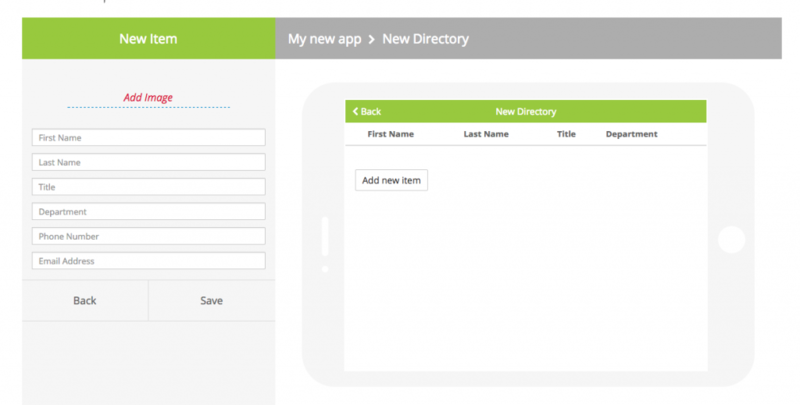 In “New Directory,” click “Add New Item” to populate your directory. What happens after I hit “Add New Item” in Directory? You can populate many fields for Directory items, like First and Last Name, Title and Phone Number, among others. * Please be advised that you cannot organize Directory items after adding them to the Directory, so please enter Directory items as you would like them to appear on screen. How should my Directory field look? If you’ve filled out all of the Directory fields, your screen should look like this. What will my Directory items look like once they’ve been saved? Once you’ve saved your Directory items, they will appear under your New Directory on the right-hand side of the screen. To add more items to your directory, hit “Add New Item” again. What do I do when my Directory is complete? 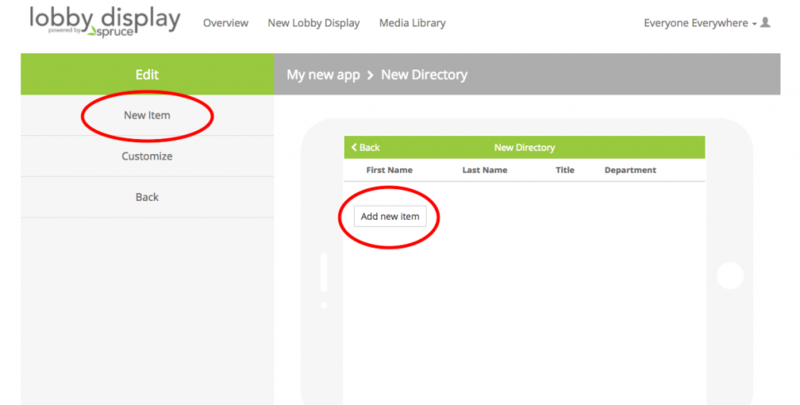 Once your Directory is complete, click “Back” and you will return to the main screen to continue building your Lobby Display App. The New Directory now appears as a button on your app. How do I add a description to my Lobby Display App? Click “Add Section,” and you will be taken to same menu as before. Choose “Text” to write a description of your app. What will adding a description look like? Provide a new title like “Building Description” and fill in other information in the “Body” field. What do I do once I’ve completed my description? 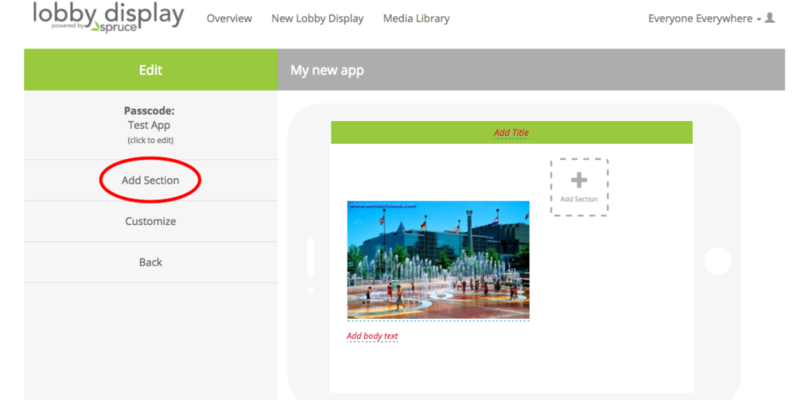 Save your description before hitting “Back” to return to the main screen for building your Lobby Display App. You can continue to build as many sections for your app as you please from the main menu. How do I view my app? Return to your iPad and open Lobby Display from there. Then choose your app by the Passcode you chose. What if I’m still having problems with my app? Contact us at help@lobbydisplayapp.com for further help.